In 2014, São Paulo nearly ran out of water. Schools closed, crops faltered and reservoirs were left at a tiny 5 percent of their capacity for the city and its surrounding population of 22 million. It was the worst drought in eight decades. The dry season of 2018 raised fears of another water crisis. And in coming years, warming temperatures will heighten Brazil’s water extremes, making both water scarcity and intense rainfall more common. Managing alternating droughts and floods alongside threats to water quality will be a challenge – one that the city’s existing infrastructure isn’t equipped to handle. São Paulo already loses over 20 percent of its treated water due to leaking pipes before it reaches the taps of its residents. A surprising and often overlooked solution can play a significant role in addressing these complicated threats. The forests surrounding São Paulo’s main drinking water system filter water and help buffer against the impacts of droughts and floods – but over three-quarters of these forests have been degraded and destroyed. This means that the water utility brings in dirtier water, driving up treatment costs and diverting resources from other needs, such as fixing leaks. 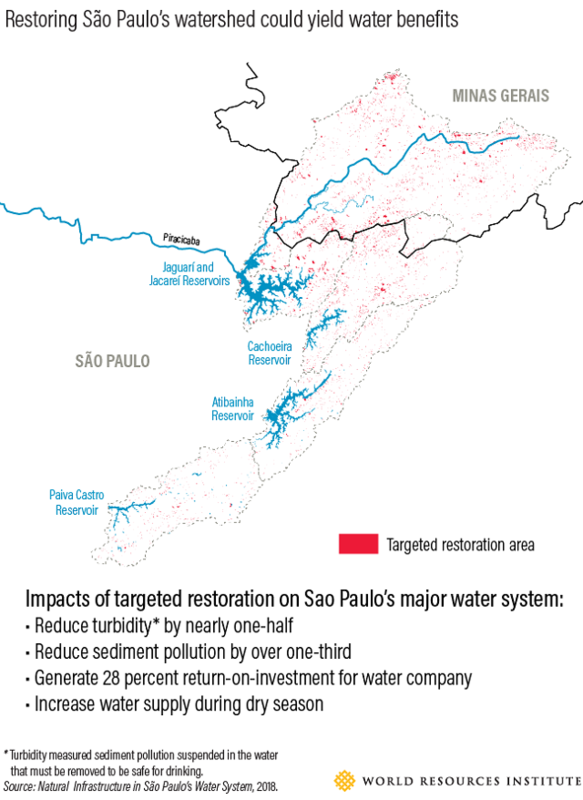 Our new report, Natural Infrastructure in São Paulo’s Water System, finds that restoring 4,000 hectares (nearly 10,000 acres) of these forests could reduce sediment pollution by 36 percent within 30 years, reducing turbidity by almost half and potentially boosting water supply when it’s most scarce. (Turbidity measures sediment pollution suspended in the water that must be removed to be safe for drinking). All it takes is planting trees in the right places. The Cantareira Water Supply System sustains around half of São Paulo’s metropolitan region. As its watershed is deforested and degraded, the Cantareira’s reservoirs are increasingly inundated with sediment that muddies their waters and must be dredged out in order to make the water drinkable. The accumulating sediment wears down the treatment infrastructure, necessitating more frequent, expensive repairs. These costs add up: SABESP, São Paulo’s water company, already spends about $22 million annually managing sediment pollution in the Cantareira. Root systems of healthy forests can manage sediment by holding soil in place, preventing erosion. SABESP, no stranger to these benefits, has planted over 1,000 hectares (about 2,500 acres) of trees on its property to reap the benefits of forests for water. Looking beyond company fence lines, restoring trees further upstream would yield the greatest water benefits for São Paulo. Reforesting 2 percent of the watershed at random would reduce sediment pollution by only 8 percent. On the other hand, restoring 2 percent of São Paulo’s forestland in priority areas – chosen using geospatial analysis – would generate a 28 percent return on investment over 30 years, by removing a third of sediment pollution, reducing turbidity by half and slashing water treatment costs. Restoration of this scale would cost $37 million over 10 years – only about 1/6 per year of what SABESP is already spending on removing and treating sediment pollution. The Atibainha reservoir in Cantareira System in São Paulo during drought. Flickr/Clairex. Unlike restoration of trees on the property that SABESP owns, this strategy necessitates partnering with farmers, rural landowners, and other surrounding stakeholders to implement. Fortunately, SABESP and other water-dependent companies would not have to build relationships with these groups from the ground up: several nonprofit and government-led programs already study and invest in natural infrastructure for water in the Cantareira. Joining forces and following the roadmap set out in our report can make investing in natural infrastructure less risky for both water companies and local stewardship programs in São Paulo. For a city still reeling from drought, steady water supply is of utmost importance in São Paulo. By filtering water, healthy forests will help ensure that reservoirs are filled with less sediment, and more precious water. But the forests themselves can increase water supply, too. A forest’s root system acts like a sponge, helping soils store water during wet seasons and releasing it during dry seasons, when the city needs it most. Much is still unknown about the magnitude that this “sponge effect” has on Latin America’s waters, but the cloud forests around São Paulo seem to have higher potential to raise the water supply. In cloud forests, leaves intercept fog, collect its moisture and cause it to drip onto the ground below, which eventually makes its way to rivers and streams. Emerging science is beginning to find that cloud forests’ ability to capture fog can sometimes be a primary source of water, especially in parts of the world with low rainfall. WRI’s new study estimates the impact that forest restoration could have on dry season water flows, when water supply is most tenuous. The findings illustrate just how powerful trees are for water supply: according to our model, if São Paulo’s watershed was 100 percent forest, dry season water supply could be as much as 50 percent higher than it is now. But if the watershed was all pasture (the most prevalent land use in the region) dry season water flow would be 35 percent lower. Even the smaller scale of restoration examined in this report (restoring 4,000 hectares/nearly 10,000 acres) would likely increase dry season water flows, and could have a higher impact if restoration of cloud forests were prioritized. There’s still so much for us to learn about how forests regulate the waters that make their way into cities around the world. 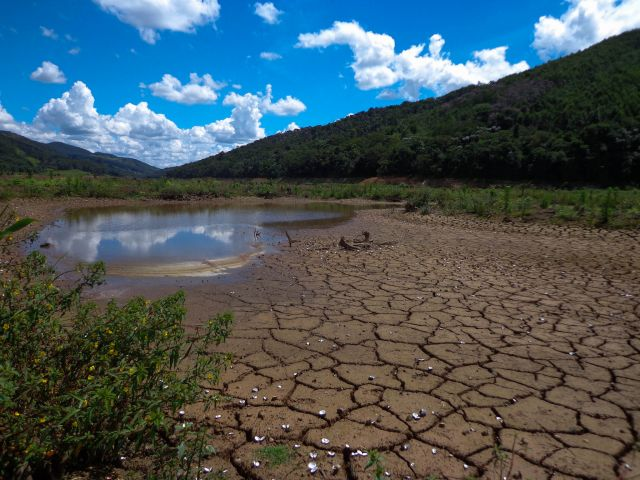 Water managers of São Paulo can use this new research to understand the role that natural infrastructure can play in enhancing water supply, especially during dry seasons. 30 years is a typical timespan for water utilities in Brazil to measure returns on investment on water treatment systems. Natural infrastructure is clearly a viable solution within this timeframe. But forests continue to grow and mature over decades, meaning benefits will accrue beyond this period. In other words, planting a seed today could pay off for years and years to come. Cleaner water is just one of the benefits of forest restoration. Restoration of São Paulo’s watershed will also capture carbon, increase on-farm productivity from due to reduced erosion and conserve biodiversity. Given the benefits natural infrastructure could yield for just one water management objective–sediment reduction – the case is clear that SABESP and related agencies should integrate nontraditional infrastructure such as forests alongside pipes and pumps. 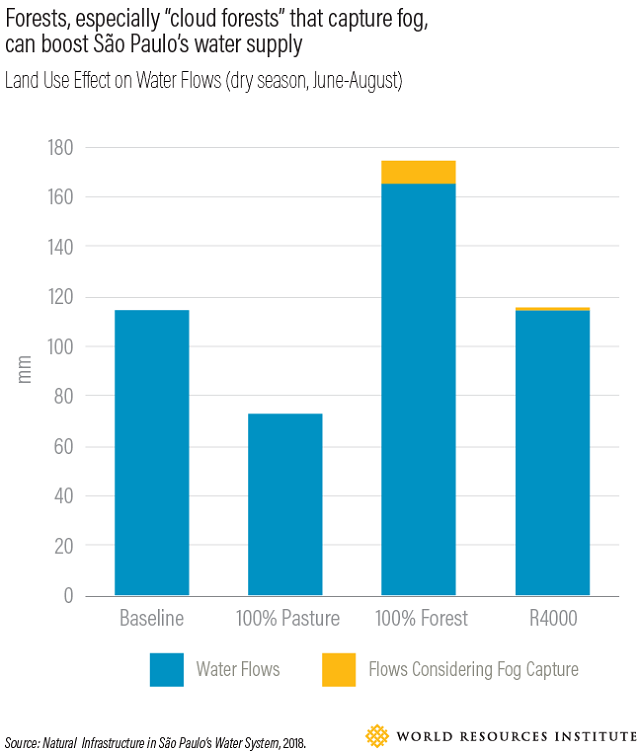 Forest restoration can boost São Paulo’s resilience to growing water crises while benefitting the water company’s bottom line. 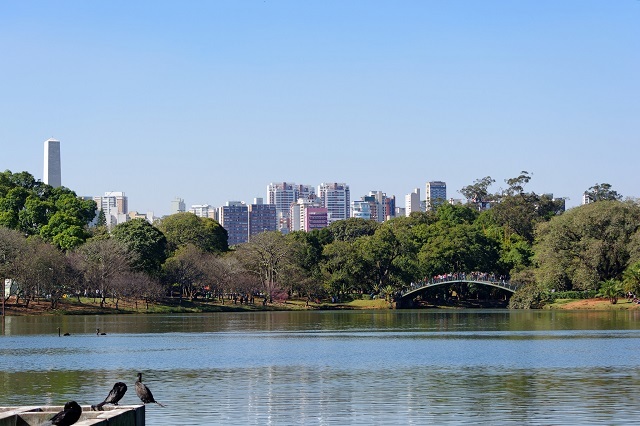 The City of São Paulo is taking steps toward integrating natural infrastructure into urban strategy by becoming one of the 45 founding Cities4Forests. Through this new coalition, cities pledge to conserve and restore forests to provide their residents with benefits such as cleaner water and resilience to the impacts of climate change. This blog originally appeared on WRI’s Insights. Suzanne Ozment is an Associate for Natural Infrastructure for Water at World Resources Institute. Rafael Feltran-Barbieri is a biologist and economist, working at WRI Brasil on Restoration Projects, Natural Infrastructures and Land Use Change. Kerala Flooding: Natural Calamity or Manmade Disaster?